Last Sunday, Wargamer.com published a short interview with Dave Arjuna (Panther Games) about the soon-to-be-released "Command Ops: Battles from the Bulge". Among other things, the issue of user-created content was mentioned. We have listened to our customers and hope they will take up the challenge and opportunity of creating their own scenarios. 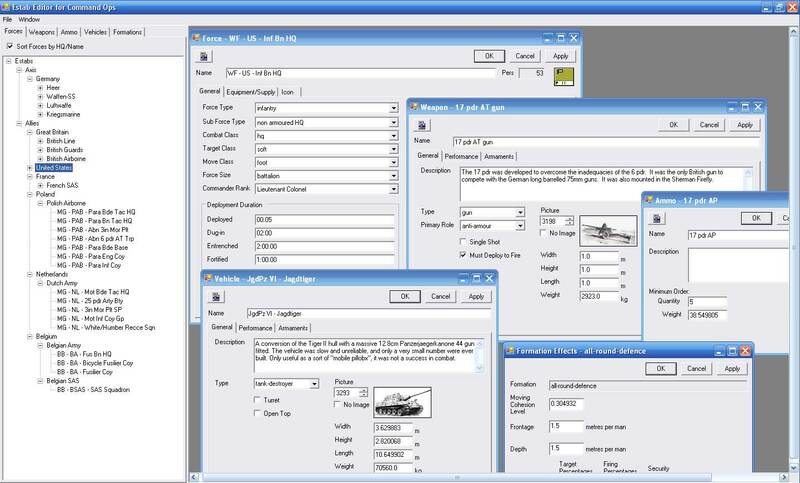 With the Estab Editor they will now have carte blanch in terms of what forces they can create and what battles they can simulate with the Command Ops engine. These news are big! It means that in addition to creating maps and scenarios (a thing you could do with previous Panther games), now you can create new units, new equipment, new ammo types. I am sure that exciting times are ahead for both scenario authors and us simple users. I have high hopes for this game. Wonder if there will be a demo. @UsF: have you tried the Conquest of the Aegean demo or full game? @Lieste: I hear you. I read the news while enduring an un-sufferable meeting. Thank goodness for the Blackberry! I was going to try the game but the cost is $80 American dollars if just digital download and $90 for physical + download. This is very high for me. I hear you. There is quite a roar about the price of this game. Have you tried any of the previous games? @JC: I haven't tried any of the previous games, but will try the demo of the previous game I guess. Thanks for the tip. Will Battles from the Bulge be available from other stores too? I like Gamersgate a lot. :> I don't know Matrixgames that well, do they allow unlimited redownloads too? I don't know if it applies, but can this game be compared to TacOps (which I haven't played either)? You should make a review and comparision on both. :D I am interested in both, so...yea, haven't found anything on your site about those yet. I tried the demo to HTTR. I thought it was OK but it wasn't quite enough to want to get it. I had heard all the great things about COTA. But, I have been spending my time on other games and had not made the plunge on any of the previous titles, although at one point I thought really hard about getting the COTA title. I eventually decided not to get COTA due to time constraints and other games I was interested in. This game, though, I had been watching and I was thinking possibly I might try it. To UsF: If you save the order #, there is a website on Matrix that you can go and download your games again. They offer extended download but a few games I did not get extended download and was still able to download my games later. I wouldn't guarantee it, though, if you do not get extended download. If you have a serial #, though, I'm willing to bet the Matrix people would help you out. And if that didn't work, you could probably get the game files from someone as long as you had your own serial number. The Matrix people are VERY helpful, though. Customer service AAA. There was no demo for HTTR or COTA. The demo that currently exists is only for the extremely old and relatively unpolished AA:RDOA.. The new Demo for BFTB is being worked up now, based on the final game code, rather than a Beta with known bugs and missing features... so there will be a slight delay until it is ready. For those troubled by the price... wait for and try the demo - it will be a free taster of how the system works in the current state, and will either confirm that the high price is too much for you, or that you may find that you are prepared to save and pay a quality price for a quality product. Please find a way to offer the game with unlimited re-download anywhere I want. I hate being limited to 30 days/2 years of re-download, since I am used to Steam/Gamersgate/Indie Developers that all allow me to re-download as often as I want/need. I do not use physical backups like CDs or DVDs, only HDDs. I want to buy it, but stopped when I saw this. Also didn't buy Empires of Steel or any other Battlefront game (directly from their site) because of this. Well, if HttR didn't make it for you because you felt the system was so-so, I can venture to say that you will miss nothing by not getting BFTB. The basic concept of the engine has stayed and have been improved a lot. Maybe you liked the HttR game engine but didn't like the battle? If that's the case you may want to consider BFTB? I'm starting to play around a bit with BFTB. I will post about that soon. BFTB is more detailed than the venerable TacOps (boy how much I love that one too!). I hear you. The price of BFTB is generating a big uproar. Relax and take your time to get it. There are more important things in life than games ... and money comes and goes. I back things up as I said, but only on HDDs (have 2x 1TB full of games (backup and active) and other things. I'd probably buy the edition with the disk version, but the price of that is even higher. Wonder why the disk version without download is as much as disk + download. The cool thing about being a community is if you keep the serial #, I am willing to bet you can find someone that would send you the zip files for the game and then you can mate up your serial #. The one thing I have always liked is that you didn't need all the steam and drm for Matrix games. You are correct. It has been so long I had forgotten I had tried that older demo of the older engine. Wow. Makes it a lot more expensive than TacOps 4 and Harpoon 3. Also, puts it within the same price range as SB Pro ($100 till August). COTA has a far superior interface than both TacOps and Harpoon, I'll even give them the edge with AI too. Harpoon I would say is probably the most complex simulation of the 3. So, does it really warrant the higher price for BFTB? For that price I would want full MP and server support. There is no server support, all multiplayer is by IP. Nice screenie for the estab editor. The keys to the kindgom! My copy is on the way from NWS. $70 plus s/h.